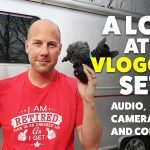 On this Airstream Life vLog, Steve explains what happened to his face. Luckily he is okay other than some scratches and abrasions. Then we hop into the car and head up to see Cedar Breaks Utah in the snow. It’s amazingly beautiful and we’re lucky it hasn’t closed for the season yet. Back at the Airstream Steve talks about the solar project he’ll be working on soon and we show off the 2019 Calendar with Steve’s 2018 photography. We’re super excited about how it turned out.